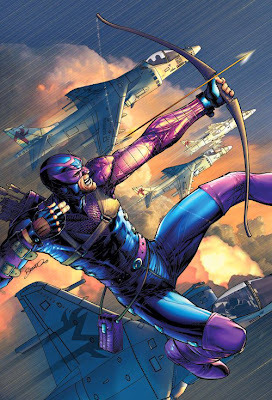 Some folks who don't get that Hawkeye has just one of the flat out coolest personalities in comics, don't get what an archer brings to an Avengers line-up that usually already contains the likes of Thor, Scarlet Witch or Cap, but there is actual living proof of just how powerful a bowman can be. His name is Lars Anderson. A Danish archer who has taken to ancient techniques with the historic weapon, Lars holds all his arrows in his hand rather than a quiver, allowing him to produce the incredible. What kind of incredible? Try shooting three arrows in the same second as you fall, or shooting targets while running backwards, or... just watch the vid (but on mute - the robot narrator is no Vision, he's annoying). Now let's see Captain America do that!